Cracked Sidewalks: Is Marquette Unlucky? The Marquette Warriors enter finals week with a perfect 9-0 record, and despite the winning streak this break in the action was perfectly timed. After losing starting center Chris Otule for an indefinite period of time due to a knee injury he sustained in the Washinton game, the Ghosts of Tom Crean Tackling Dummies re-emerged at The Al, sending Juan Anderson (3-4 weeks, shoulder) and Jamil Wilson (day-to-day, ankle) into the infirmary. Just when fans were getting jazzed about the Warriors' prospects this season! The news of the week prompted frequent guest contributor, Dr. Blackheart, to dance on the keyboard once more .... and now he asks, Is Marquette Unlucky? Jimmy Chones leaving for the ABA in the midst of an undefeated season…Dean Marquardt’s car accident… Bob “I Like to Watch” Dukiet losing star recruits to academics…Will Gates' blown out knee in “Hoop Dreams”…Travis Diener and the tackling dummy,…Jerel McNeil and the HIPPA finger…Trevor Mbwake, Dom James and the sinking feeling of the fans and the OrthoPods. And, now, in a matter of hours, the (possibly) torn ACL of our Defensive Stud Chris Otule, the shoulder of top rated freshman Juan Anderson, and the ankle of high potential Jamil Wilson. And, many more over the years. “Why Marquette?” “Why always the big men?” ”Why Me?”… are the overriding fan questions ringing around our ears. How much bad luck can one fan absorb, never mind a diehard Cubs fan who is a Brewers season ticket holder, as dysfunctional as that is on the surface? In perhaps the best and earliest Marquette outlook in 30+ years, why do all the great feelings of the past week come to a crushing end? Isn’t it Marquette’s time, as ordained by our new President and AD? The answer , of course, is “leave it to fate”. However, Pomeroy has a measure of “Luck” that, as a stat geek, I like to turn to in order to balance the emotional side of my brain with the rational. Pomeroy defines “Luck” as such: “The easiest one to understand is Luck, which is the deviation in winning percentage between a team’s actual record and their expected record using the correlated gaussian method. The luck factor has nothing to do with the rating calculation, but a team that is very lucky (positive numbers) will tend to be rated lower by my system than their record would suggest.” In other Poemroy analyses, “Luck” is most correlated to “Experience”, and Buzz has experienced guards. 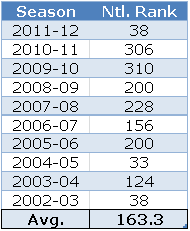 Over the past ten Pomeroy seasons, Marquette has been “Lucky” in only 3 of them, including this season to date, pre-injuries. Buzz, on the other hand, has been as unlucky as it gets. MU has set school and Big East records in the number of close games that his teams have played in. Yet, MU seems to always overachieve its talent and “Luck” at year’s end. However, to date, MU 2011 is Final Four” Lucky” with an exact rating of the DW3 year at the Triple Snake Eyes rank. Until Tuesday, MU was that “Lucky”! But, things change quickly as we know and MU is now as lucky as . So, Where Does This Lead Us Irrationales? To drink? Maybe…but time seems to be on our side. MU is waiting the Otule ACL sprain out to see its severity, Juan’s shoulder is seen to put him out until only the start of the Big East season, and Jamil’s ankle seems to be chronic but day to day, pending recovery time and Xmas practice/therapy time. Meanwhile, MU beat one of the most talented and perhaps the season’s-end best Pac 10/12 teams in Washington, without Chris Otule. His replacement, Gardner, is an offensive dynamo in the limited minutes he can offer—Pomeroy Offensive Efficiency Rating for the Ox of 124.4 vs. CO’s 92.2. Anderson, while showing flashes and providing height depth, still has only seen a few minutes. Is this unlucky? Yes, with Chris’s defense but not with his O, so DG has time to work on his game extensively, while Juice gets his chance to showcase his skills. In the end, this provides minutes to those that Buzz has had no qualms about playing in the Out of Conference anyway, making MU a stronger season’s- end team, waiting for the hopeful return of the injured. LSU and Vandy will give MU height problems, but MU’s experience will carry the day into the Big East, as my irrational mind tells me as I wish upon on northern star. MU buries the tortured artist, Judeo-Christian, Martyr syndromes, and assumes its rightful place as #1 in the country (says a fingers-crossed Cubs fan in a full body cast, but looking good it his Man Uggs). Go MU (I hope)! Regardless, I am playing my lucky 19 and 77 at the Potto Bingo Boat, but I sure wish Andre Walker picked MU over Xavier right about now.